Winter was late, but it's here now! Time for fun in the snow. This past weekend during Martin Luther King Jr.'s birthday weekend, we filled the neighborhood with plenty of snow and plenty of cold temperatures to freeze Eben Ice Caves. Stop in for Chicken Cranberry Rice Soup, our heavenly Cheesecake or Bread Pudding, a Maple Steamer, or a Beef and Cheddar Panini made with Chuck Roast and Sauteed Onions. Sitting in the Cafe dining room looking out at the dove gray skies, breathing the apple cinnamon through my nose, my mind imagines it's been a wonderful year for apple orchards. I mean, it smells that way to me! People in the neighborhood have been making cider, apple sauce, apple butter, and who knows what lately. Me? I'm baking Grammy's Apple Mess. It's a recipe that my mother wrote down while listening to a radio show in our cape cod house on Tunxis Ave in Bloomfield Connecticut. I was a little girl who loved this Apple Mess, and at the time, couldn't understand why we couldn't whip the crab apples that hung over Mom's 1954 pink Crown Victoria into such sweetness. This recipe is absolutely fantastic to make with a young person in your life. Measurements are easy and forgiving. Preheat your oven to 350 degrees. Chop your apples. Shape and size don't particularly matter. Put the butter into the bowl. Microwave on high for about 1 minute to just melt it. Beat the eggs into the bowl with the fork until they're well mixed. Add the sugar, baking soda, baking powder, salt, cinnamon and continue to mix with the fork. Add the flour and stir just until incorporated with the wooden spoon. Throw in the tart apple chunks and stir gently with the wooden spoon. Scoop it all into the un-greased square pan and bake for 40-45 minutes at 350 degrees. Put a scoop of ice cream on top when serving squares, or dollop with pure whipped cream. Welcome to summer where forest meets farm. 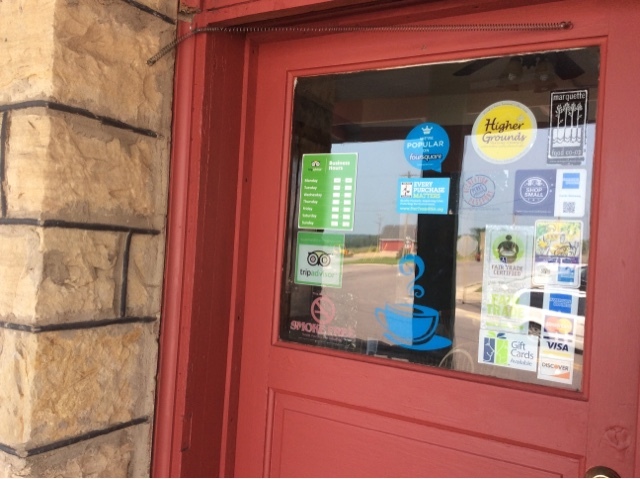 Rock River Cafe has shifting hours and menus reflecting local foods and activities. We are currently open Wednesday through Sunday, Noon till Eight PM through October 31st. Come and enjoy homemade sauces and dressings, local fish, locally baked bread, dilectable desserts, and more in our cozy dining room filled with local art or Al Fresco on our porch. We are a short drive from Munising, the Gateway to the Pictured Rocks National Lakeshore. Waterfalls are on the way, and Laughing Whitefish Falls is a few miles west of the cafe. We've just opened the Rock River Cafe' for the summer season. Every season we play around with the menu and think about new ways we can feature local ingredients. My favorite this year is our Sencha Green Iced Tea sweetened with our Backyard Mint Syrup made from Rock River Perennial Garden and Greenhouse Backyard Mint. The balance of subtle sweetness, green tea flavor, and mint suspends perfectly over ice in our mason jar mugs. My granddaughter enjoys chewing on the mint sprig in her glass. 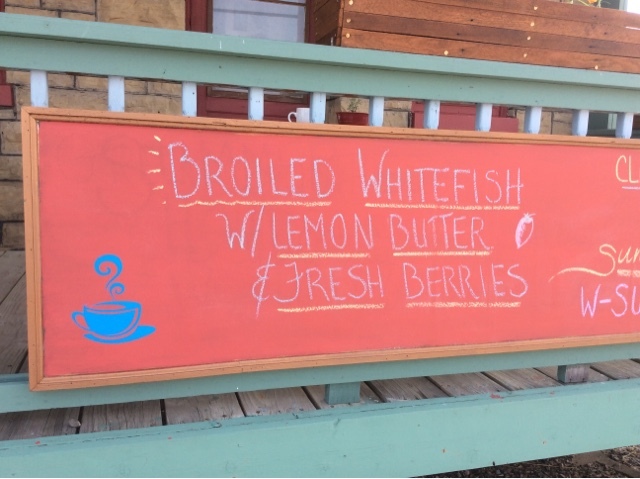 We've been loving the fresh Lemon Thyme gracing the grilled Lake Superior Whitefish as well. We are still sautéing up Local Wild Leeks from Reh-Morr Farm with fresh veggies for dinner. I've been loving them so much that I almost forgot to make some Leek Relish to hold onto the flavor for a while. And then there's Rhubarb Syrup to drizzle over ice cream in a homemade gingerbread waffle bowl. Follow the link to Martha Stewart's website. We make ours a little differently but end up in the same place of wonderful! There lies a heavy reminder of snow on the ground, but spring will win, it always does. I peer out across the landscape under heavy cloudy resistance at the sandy snow, dirt, puddles. It all feels so slow. It's hard to believe that powers are changing the landscape, unseen. The cluster flies know. They're bouncing on the windows incessantly attempting penetration as ages old instincts sing of tilled soil by machinery or hoof, and the exposure of moist, forgotten earthworms. We wait. And those who cannot wait create varying landscapes for their amusement, dialing the channel from this to something else. Spring break? There's that. That's what we've done. We've escaped the molasses flow of spring and hurried to a place alive with it already, filling our hearts with birdsong and flowers, the music of it still playing in our minds upon our return. 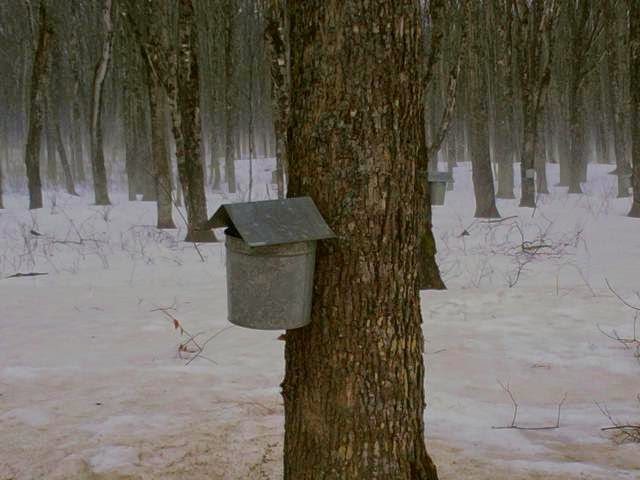 Our closest friend derives the sap from the maples this time of year. It's the first harvest from the land. And how sweet it is! I'll share some ideas a little further down the page. The hoop houses in the area are filling with seedlings in total disregard of the grey sky-grey snow. I'm sure the caretakers can't even notice the creeping weather. How could you when your eyes are filled with the miracle of seed? Earth, water, seed interacting to create life, which sustains life, which creates life again. Science and Miracle dance this time of year so obviously, so carelessly, so abundantly, and so confidently. Nature awakens in everything, from first sap, to creation of next year's seed. I encourage you to taste, slowly, the first evidence of fresh, local spring that passes your lips and hesitates on your tongue. Using an espresso machine, steam and froth the two ingredients together. The more froth the better, as Maple Syrup is heavy and the froth with fight to suspend it in every sip. Add as much milk as necessary to the other ingredients so your blender spins everything up well.